182R, N9772H, collided in midair about .5 miles from the approach end of runway 19L at the Fairbanks International Airport, Fairbanks, Alaska. The Cessna 152 was being operated as a visual flight rules (VFR) local area instructional flight, and received minor damage. The Cessna 182R was being operated as a Civil Air Patrol (CAP) VFR positioning flight as CAP Flight 5043, and sustained substantial damage. 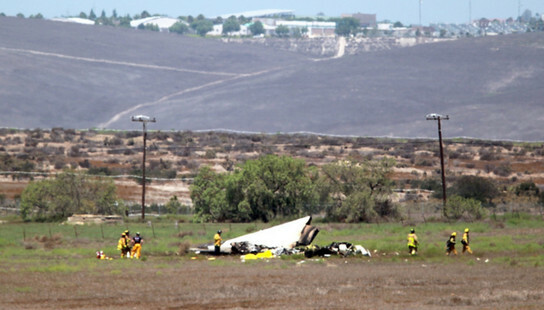 Both airplanes were operated under Title 14 Code of Federal Regulations (CFR) Part 91, when the accident occurred. The certificated flight instructor (CFI) in the right seat, and the student pilot in the left seat of the Cessna 152, were not injured. The private pilot in the left seat, and the pilot-rated passenger in the right seat of the Cessna 182R, were not injured. Visual meteorological conditions prevailed. Office (FSDO) reported that the Cessna 182R had been cleared by controllers at the Fairbanks Air Traffic Control Tower (ATCT) for landing on runway 19L, and was on final approach. The Cessna 152 was on a right downwind traffic pattern for landing on runway 19L, and was number two for landing. The pilot of the Cessna 152 was told to extend his downwind pattern, and then to do a right 360 degree turn to allow additional spacing between landing airplanes. Instead, the pilot of the Cessna 152 made a left 360 degree turn. The left wingtip of the Cessna 152 struck the rudder of the Cessna 182R. Both airplanes landed safely. investigator-in-charge (IIC) on November 14, the flight instructor of the Cessna 152 reported that he was on a right downwind for landing, and the student pilot was at the controls. The flight instructor said that he was told by the ATCT specialist to extend his downwind pattern, which he did, and then turned base. He said that the CAP Cessna 182R was “in sight,” and he heard the CAP airplane being cleared for landing by the ATCT specialist. He turned final for landing, and about 300 feet agl, the nose of the CAP airplane appeared under his airplane. He applied full power and began a left climbing turn. The ATCT specialist advised him to make a right 360 degree turn, but he was already in a left turn, and advised ATCT of his actions. He then asked the ATCT specialist to visually check his landing gear as he flew past the tower, and was told that the “gear appears good.” He then landed without further incident. After landing, he discovered the leading edge of the left wing was flattened and dented at the tip, and the wingtip fairing was cracked and broken. During the landing approach, the pilot heard a “bang” and the airplane yawed, but he saw no other airplanes. He thought that the airplane had been struck by a bird, so he asked the ATCT specialist to visually check his landing gear. He was advised that all three landing gear were visible, so he completed the landing. After landing, he discovered that the top right side of the rudder had sustained denting, and the rudder cap was broken and missing. Fairbanks FSDO personnel arrived to begin their investigation. The National Transportation Safety Board determines the probable cause(s) of this accident to be: The failure of the instructor in the Cessna 152 to maintain separation from another landing airplane and his failure to follow the tower controller’s instructions. Be the first to comment on "Two Alaska CAP Planes Collide in Mid-Air"